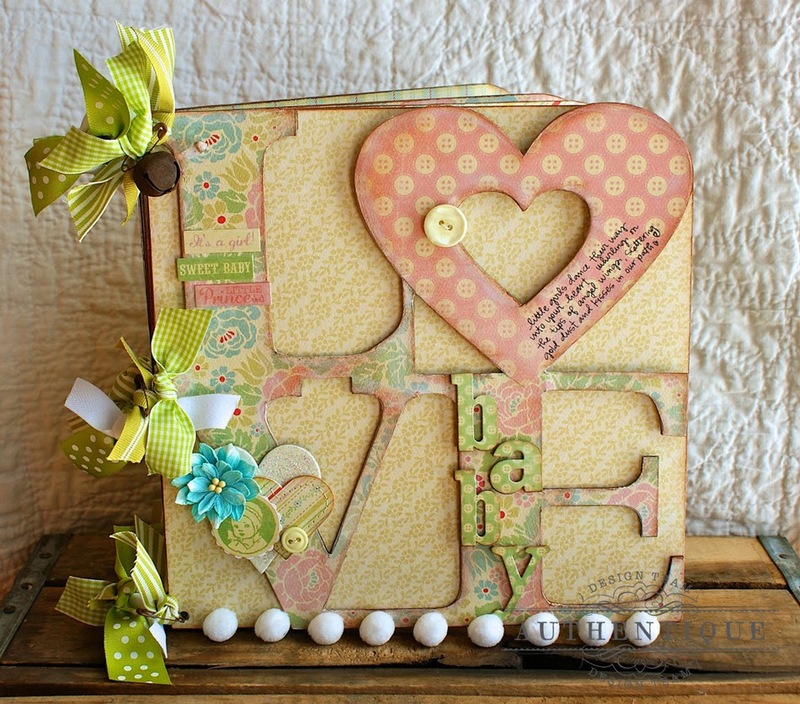 Hey everyone, it's Hilary here today sharing a sweet baby album made with the Love Squared Album by Leaky Shed Studios. I haven't made a baby album in some time, but I'm so in love with Authentique's "Precious" collection, I knew it's what I wanted to make. 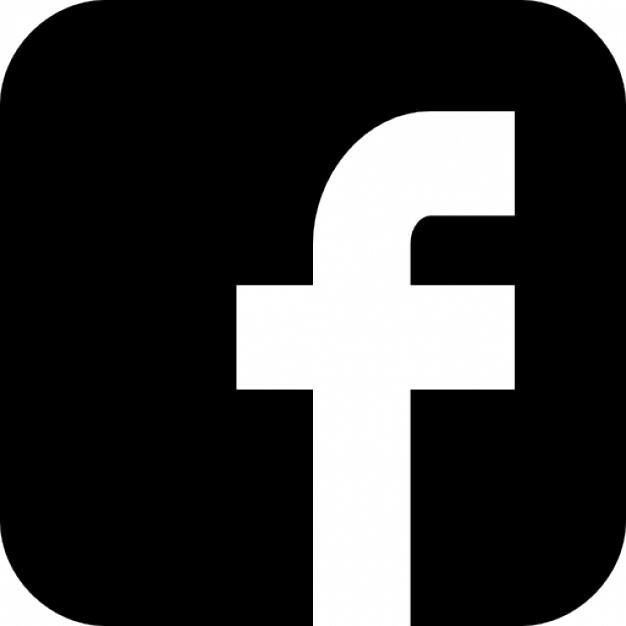 I have a few friends who are expecting, and this project is a great start. I hope you enjoy it. I have never worked with Leaky Shed products but I have to tell you...as someone who just loves raw chipboard, these albums were amazing. The "Love" cut out on the front is very sturdy, it took a lot of abuse as I was decopaging papers, and then sanding, and inking. It holds up just beautifully! I love thick chipboard, and the pages that accompany the album are about as sturdy as I've ever seen...perfect for a mini album. For the cover I simply traced the "Love" wording onto the pattern paper I wanted to use, then I decopaged it to the chipboard. I cut out a second "heart" in a coordinating pattern so it would pop out. I then embellished the front with glittered hearts, die cuts, buttons and flowers. 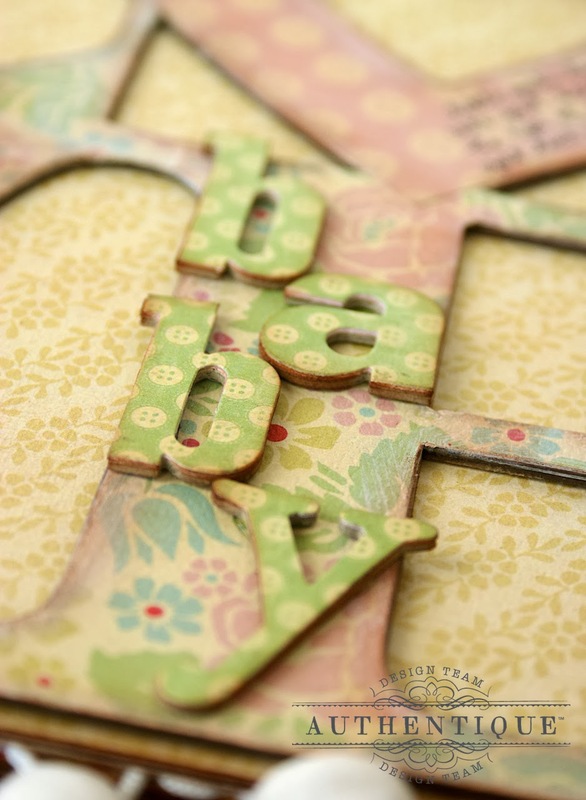 For the "baby" letters, I used chipboard to die cut the letters then covered them with pattern papers. For the inside of the album, I simply covered the pages with pattern paper, then added simple elements to the corners of the pages. I used the smaller pattern paper to make photo mats, and just gave the inside a very simple look. For this project I used papers and embellishements from Authentique collection, "Precious"
miscellaneous ribbons, crochet trim and pom-pom trim, wooden hearts by Maya Road, safety pins and a rusty bell. Thank you all so much for stopping by. I hope you enjoyed my project as much as I did creating it, and I hope this inspires you to try one of your own. I hope to use Leaky Shed in the future, I just adore their products. 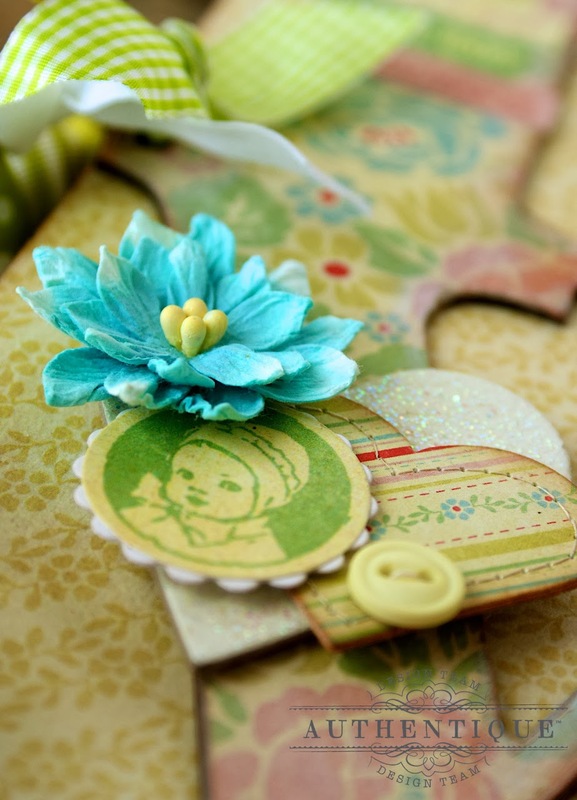 It's not often I get to play with sweet baby things these days, so I really enjoyed using my Leaky Shed chipboard mini album and embellishments and Authentique's adorable Precious collection to create a little baby boy album. I kept my design simple and uniform throughout my album for a cohesive look that's quick and easy to put together. I simply covered each page with patterned papers then added a central panel of contrasting papers, trim, journaling cards and embellishments. The sweet baby chipboard embellishments from Leaky Shed were the perfect way to dress up my album. Each chipboard piece was given an aged finish with white and green paint, followed by brown inked edges and a bit of sanding. I added buttons and twine for a final detail. Sweet and simple. I think your "Precious"collection may be one of your best ever. And I say that every time a new collection comes out it seems. But these one is absolutely beautiful. WOW! These are both just beautiful!!! I'm really loving this paper. 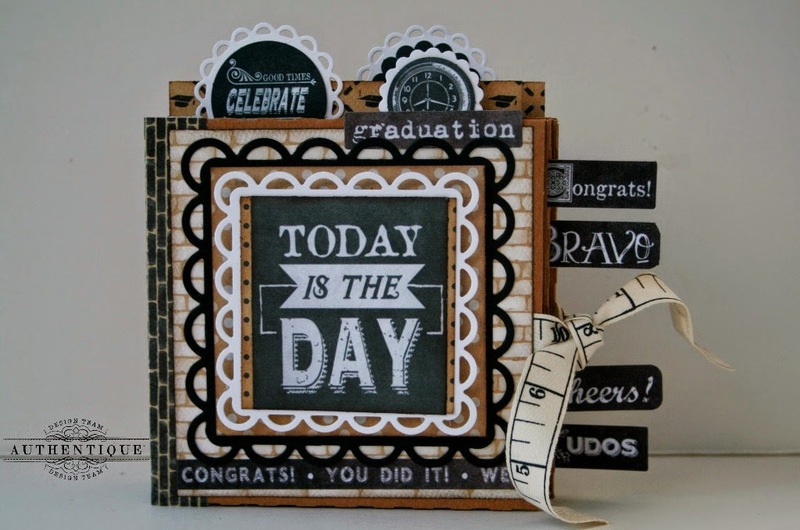 Beautiful work with the chipboard albums! 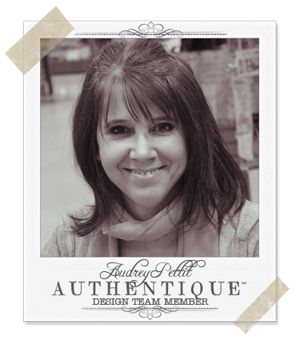 I just love all the Leaky Shed and Authentique projects. Beautiful work. I just love these SO much! 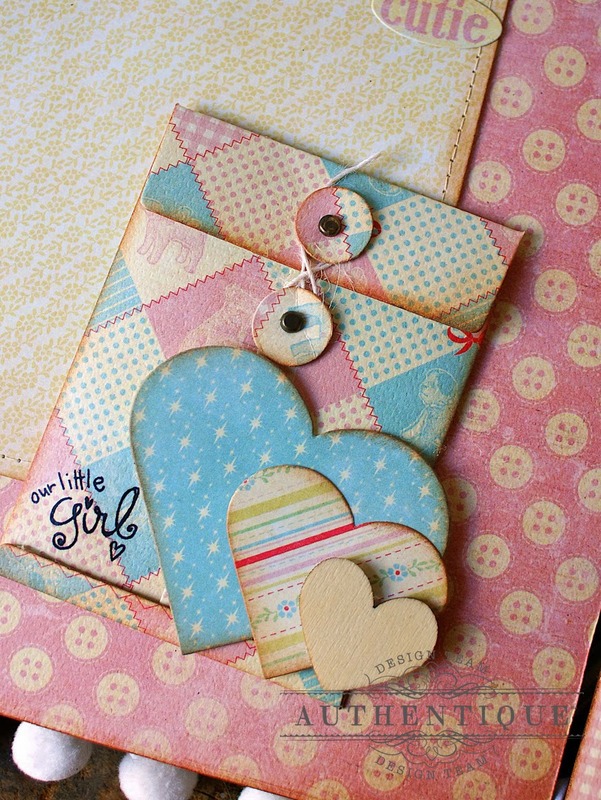 Very sweet and pretty projects! These are both super cute! I really like that Love album. I'm working on two mini albums that I'll give as gifts at two upcoming baby showers. this post couldn't have come at a better time. Thanks for all of the ideas. I love the albums. Absolutely beautiful baby albums. Have to say the chipboard really makes the pretty papers stand out! These albums are fabulous! I have a granddaughter joining the family in June and would love to make one of these for her parents (or maybe keep it for myself). The papers are incredible. Thanks for sharing and inspiring. oh my I am so in love with the gorgeous colors! so dainty! love all the projects!!!! Absolutely adorable baby minis!! 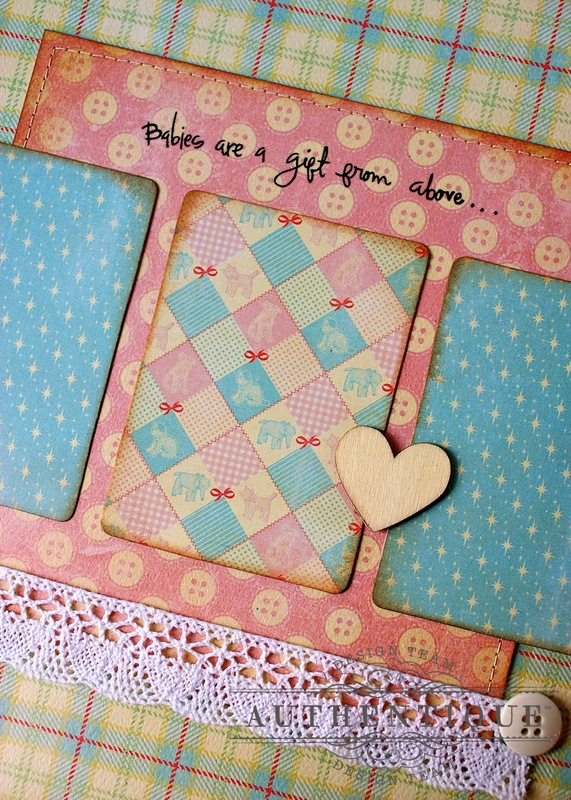 Love the chipboard shapes and the delicate colors. What a perfect pairing: Authentique and Leaky Shed. 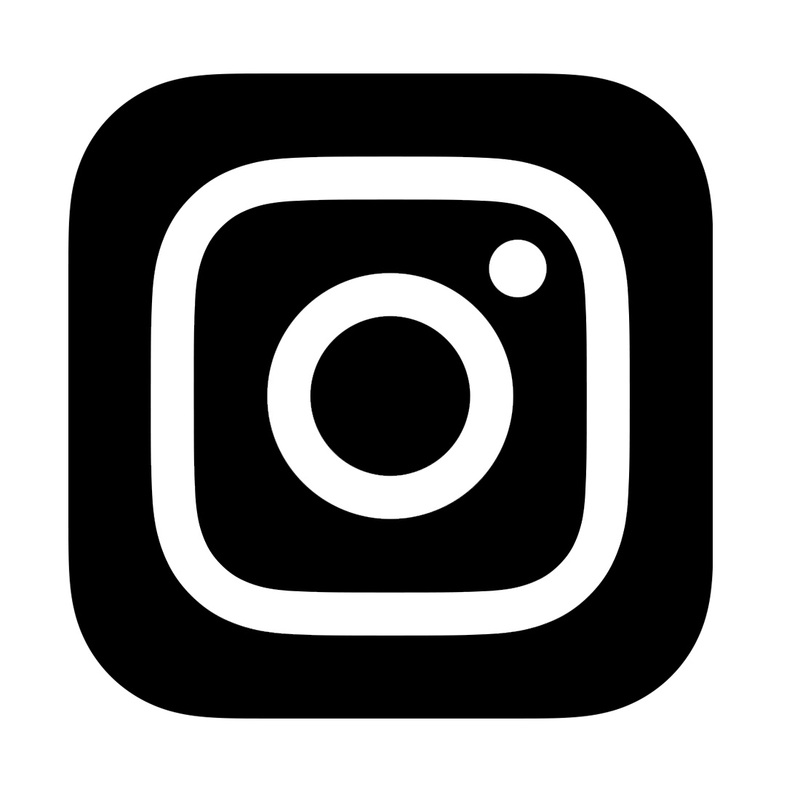 Thank you, Authentique, for introducing me to LS!! These mini baby albums are adorable! Love how each one was embellished. There are some great ideas that I may have to scrap lift for my little ones! TFS! The baby albums are fabulous. Especially loving the cover of the first one. Love the baby albums! 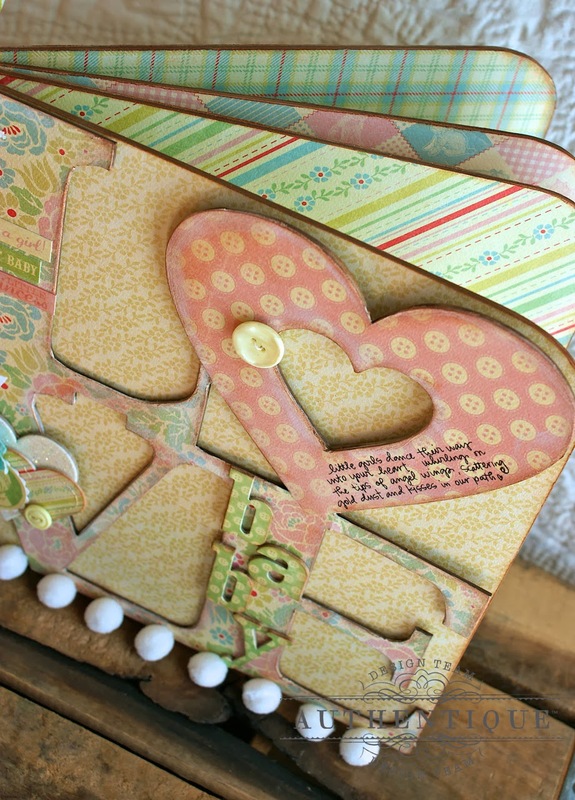 So many cute touches...beautiful use of that "LOVE" album! i just love the baby book, with 5 people being PG at work, what a great gift idea. thank you for sharing!! Oh my goodness, what Adorable mini's!!!! 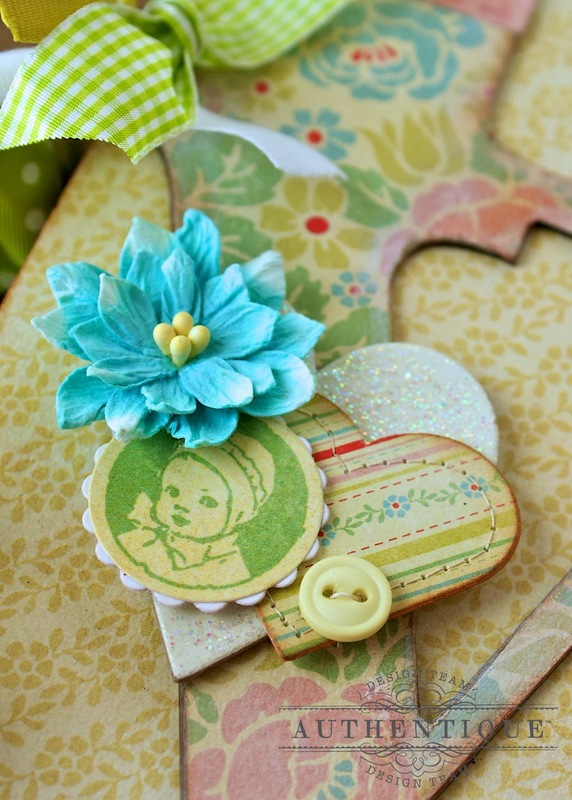 Darling baby projects here today! Just so sweet. That little baby stroller is so precious. The albums are very sweet. I love those precious papers. These mini albums are so beautiful! I love all of the embellishments and layering. Such pretty colours, patterns, dimension and layers!!! 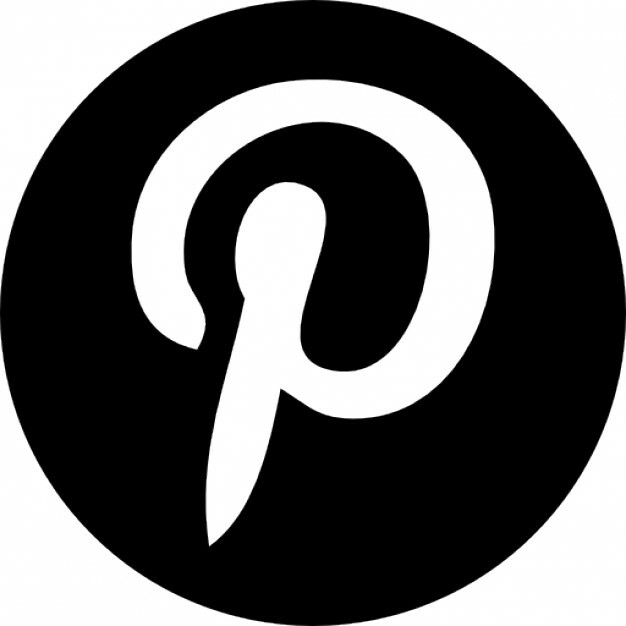 Simply AMAZING projects from two of my most favorite designers! LOVE these. The 'precious' collection is perfect for tons of projects....a real 'must have'.